Rarely does a concept car reach production with so few changes as did the LexusLC. The dramatic two-plus-two coupe looks different to everything else on the road, acting as a halo model for the premium Japanese brand, not to mention its parent company Toyota. The last time Lexus did this, the magnificent all-carbonfibre LFA was the result, and now, at a significantly more attainable price tag, it’s done it again. It’s this halo status that is important here, because the LC Coupe is a vanity project at its core, meaning that it was formed with a different set of rules to higher-production models. The front suspension design, for example, was designed specifically for the LC in order to reduce the bonnet height over the front wheels as much as possible – an expensive exercise for the sake of detail proportions. Exotic materials like carbonfibre and aluminium make up the LC’s structure, the interior is finished to an impossibly high degree, and the engines are at two ends of very different spectrums, but appeal to two very different buyers. The LC range will soon expand too, with rumours of a hot LC-F swirling alongside spied prototypes, while a thinly veiled convertible concept version will also reach production in time. The LC is not perfect, but the car industry is a better place for it. If you’ve not already guessed, we rather like the Lexus LC, and although there are one or two caveats, this is a truly spectacular road car. The LC 500 Coupe starts at $100,385, which you might agree is a relatively small amount of money for a car as striking as this. Both the V8 and V6 hybrid cost identical money, are available in a choice of three trim levels and do without the myriad of individual options usually seen in premium rivals. All models are well equipped, with the entry car coming with standard 20-inch alloy wheels, a leather interior, adaptive dampers, a 10.1-inch infotainment display, a glass roof and an LFA-inspired digital dial set. Move up to the Sport Pack model ($106,512) and you’ll also pick up heated and ventilated seats, forged 21-inch alloy wheels, a carbonfibre roof and a split leather and Alcantara interior trim. It’s the Sport+ Pack model that is our pick though, adding rear-wheel steering and a limited-slip differential to the package. At $113,065 it’s a generous $13k jump over the standard model, but its ability to better exploit the LC’s inherently playful chassis makes it a worthwhile choice. Options are limited to an upgraded Mark Levinson stereo and head-up display. Lexus also likes to introduce special colour and trim packages at the top of the range, the latest being a Naples Yellow package, matching the yellow exterior colour to a multi-tone interior with yellow Alcantara accents. It’s a bold look, but definitely in keeping with the LC’s avant-garde design. At this price, the LC intercepts a variety of GT rivals, such as the new Porsche 911, right through to something much more opulent in the Mercedes S-class Coupe. 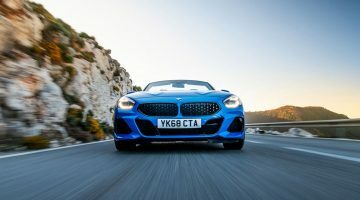 The BMW 8-series Coupe is probably its most direct rival right now, with a pocket-friendly 840d model matching the LC hybrid’s more laid-back approach. At $99,959 for the 840d M Sport, it’s priced within a few hundred pounds of the Lexus, too. The LC500 V8’s sporting bent puts it up against some rather more serious rivals, but undercuts the new Porsche Carrera S ($122,029) and BMW M850i ($130,437), even if the Lexus lacks the outright pace of its two German rivals. The Lexus LC Coupe in both hybrid and V8 forms is not the fastest GT car in its class, that’s for sure. The hybrid, despite a reasonable 359bhp combined power figure, takes a leisurely 5.0sec to reach 100kph. Performance then, is hardly electric, but as a cruiser the hybrid’s powertrain does just about enough to make it feel fast enough for cruising situations. Top speed is pegged at 250kph. The LC 500 V8 is only 0.3sec quicker, reaching 100kph in 4.7sec, despite the generous bump in horsepower. The V8’s 458bhp isn’t that much more accessible either, thanks to its 7100rpm peak power, although we’ll get back to that later. The crux with the LC Coupe in all its forms is that if you’re expecting this GT to be supercar fast, you won’t find it in the LC, but, and we’ll get to it, is all part of the charm. As mentioned above, the LC Coupe is available in two distinct forms, which totally changes the LC’s character above all else. The more demure, sensible option is the LC 500h, which as its name implies, is a hybrid. This is no Porsche Turbo S e-Hybrid-style powerhouse, rather a more laid-back combination of the Toyota group’s naturally aspirated 3.5-litre V6 engine and a small electric motor and lithium-ion battery pack. Instead of being able to run on pure electric as a plug-in hybrid, the LC 500h’s parallel system is more about engine assistance. Power is fed into the batteries by a regenerative braking system, and power fed from the petrol engine. The transmission is equally non GT-like, featuring a new type of CVT gearbox. Rather than simply have a single belt-driven gearbox with infinite ratios, the Lexus instead has a total of three, CVT-like gears, each with three ‘steps’ within them to emulate the feeling of a short, sharp gearshift. There is then another, fourth gear which brings the total to ten, real and/or virtual gears. This gives the impression of shifting gears as the car accelerates, more akin to a normal automatic transmission. 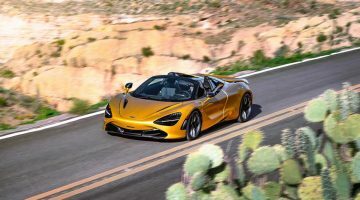 The second engine and transmission combo is more traditional, pairing a naturally aspirated 5-litre V8 engine with a ten-speed torque-converter automatic gearbox. The engine is the same Yamaha-fettled unit found in the current Lexus RC-F, and it’s a wonderful, sonorous, charismatic unit that totally redefines the LC. The hybrid, although not inherently bad, is a calmer, diesel-equivalent GT cruiser. Paired to this V8 though, the LC’s character totally changes. The auto’s shifts are short, sharp, and in sports mode decisive, but left to its own devices can dither about – a complaint common with many transmissions with so many ratios to choose between. Approach the LC as a pure GT and it has one fatal flaw. The ride is too hard-edged, even on the entry-level model’s smaller 20-inch wheels. It’s not unsophisticated, as the adaptive dampers do keep sharp intrusions to an acceptable level, but it’s the stiffness of the springs themselves that are the issue. As a result, the LC 500h is a little contrived, as its powertrain doesn’t indulge or encourage, yet is too stiff to make for a comfortable GT. 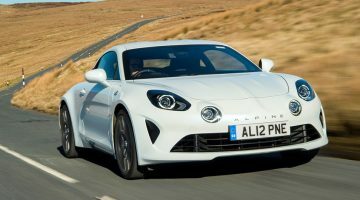 The V8-powered LC 500 is a totally different proposition, as its engine completely changes the character of the car, unlocking a different side to the LC. The firm ride is suddenly less of an issue, as the V8 is the ultimate sidekick, encouraging you to exploit the chassis, unveiling its wonderfully playful and agile stance. The car doesn’t quite shrink around you, but its limits are instantly palpable, the steering, although not feelsome (so few, if any, really are these days) accurate and reliable in its turn of response. It’s a surprisingly quick rack too, and whether it’s paired to the LC’s four-wheel-steering system or not, turns in quickly and decisively, with an accuracy and composure underpinned by the innate capability engineered into the chassis. It really does feel like a giant GT86, in the best way possible. You’re never left wanting for more power either, in fact it’s this relative lack of grunt that seems to more gently introduce you to the LC’s underlying character, which is just so entertaining. Start to push harder and the exploitable balance remains, even if traction doesn’t. The playful edge means that wheelspin can be an issue, especially without its limited-slip differential, but it doesn’t detract from the overall experience by any stretch. The LC 500, in V8 form anyway, is a truly unique car in the segment. The obvious response here is that if L/100km and running costs are a consideration, then the LC 500h is the better bet. The hybrid will achieve around 8.1L/100km depending on its driving environment, with the V8 some 28.2L/100km off that figure. Drive gently with either and these figures are achievable mind, and thanks to its lack of forced induction, driven hard those figures won’t drop quite as dramatically as others. Lexus’s upstanding reliability reputation is also a factor. The interior of the LC is wonderful and irritating in equal measure, as the design is fresh, distinctive and wonderfully executed, but hampered by irritating electronics. You sit low in the LC, and the shelf-like dashboard and narrow daylight openings do make it an initially intimidating place to sit, but the interior’s innate quality and thoughtfulness is clear. The focused driver’s display isn’t new for Lexus, having been applied to various models since its debut in the LFA supercar, but its effect is no less dramatic, and it still looks sharp, uncluttered and distinctive. Other elements, even simple ones like the interior door handles, display a different level of thinking that Japanese manufacturers like Lexus and Mazda have begun to employ with great effect. The handle itself is smooth, cold aluminium, and has no backing, rather sprouting from the concave Alcantara sections on the door. Why Alcantara? Lexus has applied it there specifically to brush against the back of your hand as you reach for the door handle. Novel or creepy? You decide, but it all adds to the aura. Be brave with the interior colour specification and the LC Coupe’s interior can look just as avant-garde as the exterior, which says a lot. Then we come to the infotainment system, which like so many Lexus systems is a complicated mess of sub-menus and a flawed input method. A common test is how long it takes one of us to disable the navigation after first getting into a new car and leaving the office at the end of the day. The Lexus system took over five minutes – it’s not slick, clever or intuitive. The LC’s exceptional build quality is undeniable though. Simple elements – the button to open the glovebox, the feel and movement of the volume knob, the spring of the drive mode selector – all of it feels finely honed and perfectly executed. There are next-to-no shoddy plastics, the leather is smooth and aromatic – it feels like an interior of something far more expensive. The LC is a car of extremes, and the design is no different. For a car with a sub-$130k price tag it turns heads like few others. The shape itself has been finely crafted, the bonnet low, surfacing full and tapering cabin perfectly accentuating the wide hips. Look closely and the myriad of different finishes and materials can jar, but on the road, once moving, it’s elegant and aggressive – in perfect partnership with its overall character. There are some awkward angles, and if a subtler method of travel is preferred then the LC might be a little much. But credit where credit’s due – the LC’s whole package is perfectly suited to its design. The LC is just brilliant – it follows no lead, it wants for little and has such a strength of character that on looks alone it makes for a fascinating alternative to the European opposition. But the fact the chassis, engine (as a V8) and interior live up to the outrageous design, makes it a real evo favourite. It’s that good.